FUENTE products are specially imported from Holland. Tierra colours by FUENTE are the basis for natural hair colouring. This colouring provides for a warm, authentic, intense and expressive look, especially friendly for hair and scalp. Countless colour variations and blending tints provide for a sparkling, original, colourful and shiny effect. It goes without saying that the final result covers 100% of grey hair. The complete colour spectrum of Tierra Colours – including the blending tints – is made up of 84 colour variants. All providing optimum cover and protection. FUENTE: The colours of nature. Some of the products in the range are ammonia-free. Please ask for more details at your consultation. Delicate SPA MIST works very gently as well as powerfully. 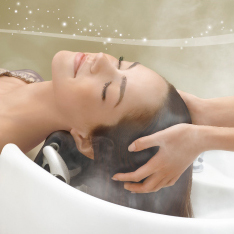 This is a new form of relaxating hair and scalp care. English weather and hard water could damage your hair but SPA MIST gives back your hair moisture and revives your hair. SPA MIST efficiently removes dirty and greasy residues from home hair care products, and makes your hair and scalp clean so the treatment effect will last longer.